Sinn Féin councillor in Kildare Ide Cussen resigned from the party earlier today. Peadar Tóibín resigned from Sinn Féin after he voted against the abortion legislation in the Dáil and was suspended from the party. FORMER SINN FÉIN TD Peadar Tóibín has signed up two members to his new party since resigning last week. A Sinn Féin councillor in Kildare Ide Cussen resigned from the party earlier today. Former Cork Sinn Féin councillor Ger Keohane has also signed up. Cussen told TheJournal.ie this evening that she resigned this morning due to there being no freedom of conscience within the party in relation to the abortion issue, adding that she holds no ill-will towards the party, and adding that she was not bullied or isolated within Sinn Féin. She was keen to state that she has lifelong friends in Sinn Féin and was never cautioned by the party. While she said today is a sad day for her, she intends to “stand shoulder to shoulder” with Tóibín. When announcing his resignation from Sinn Féin last week, Tóibín hinted he would be setting up of a new political party. Prior to his resignation, Tóibín was suspended from the party for six months because he voted against the abortion legislation in the Dáil. His new party has drafted a draft manifesto, which states that one of its core values is that it believes “all human life should be protected and that no mother or child should be left behind”. We seek to protect the most vulnerable in society at all stages of life. We believe that all of the necessary economic and social supports must be provided to mothers and families to ensure that they can raise their children in confidence. The party is described as a “Euro-critical party” and one that opposes European federalism and a European army. It also state it will be a party that protect the freedom of conscience of elected representatives. A number of open meetings are to be held around the country in the run up to Christmas with regards to developing the organisation. The events will be held in Kildare, Dublin, Tralee, Cavan, Navan, Dundalk, Wexford, Mayo and Monaghan. The party’s draft manifesto, which Tóibín said it is subject to change, with additions to be made over the next two months as the party “broadens it engagement with new members”, states that the organisation will be a 32 county grassroots, political party. “We seek an Irish Republic, where the objectives of the 1916 Proclamation, to ‘Cherish all the Children of the Nation Equally’, are achieved,” it states. The party will also seek to give a voice to the significant portion of the population that currently have no voice in Leinster House or Stormont, states the document, adding that significant political reform not just in the institutions but in the political parties also is needed. Housing, healthcare and education are human rights are also key elements. We demand an end to ineffectual establishment ministers who prioritise the needs of vested interests over the common good. We demand that promises made to people disabilities be finally matched with resources and funding. We seek an end to the shocking growth in waiting lists for mental health services. Funding and tackling maladministration especially in Health care are both massively important, the latter still not getting the attention its needs. Tóibín’s manifesto states that to achieve “economic justice fuelled by the spark of healthy functional enterprise”, there must be an economic incentive for those “who work hard, take risks, invest, and spend time in education”. It states that workers are entitled to fair wages and terms and conditions that allow families to thrive, adding that spiralling costs, a threat to workers and employers must be met by facing down supply side vested interests. “There must also be an end to the over concentration of wealth in the hands of the 1%. We seek tax justice as an engine for a fairer society,” states the document. 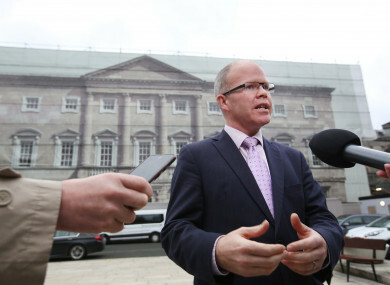 Tóibín states that his new party will work to end the system that sees ministers captured by a department bosses. Social responsibility and fiscal responsibility is also mentioned, as is the need for the pluralist society that welcomes people from all religious and none equally. “We oppose the rudderless spatial development that is emptying rural Ireland and overheat Dublin. Demand must be met by infrastructure on the east coast but new infrastructure must be built to stimulate population growth on the west coast,” it adds. Speaking to TheJournal.ie, Tóibín said he is “delighted” that two members have signed up to his new organisation. He said he is talks with 20 other representatives and is confident that a “good chunk will come on board”. While the party has no name yet, Tóibín said his new party will be a “grassroots, activist organisation” which will make decisions collectively among its members. Email “Tóibín signs up two members to his new 'Euro-critical party' which aims to protect 'all human life'”. Feedback on “Tóibín signs up two members to his new 'Euro-critical party' which aims to protect 'all human life'”.